Ohio Wesleyan’s Nick Carlson puts up a shot during the first half of Monday’s NCAC showdown against visiting Oberlin. Oberlin assistant coach Nate Axelrod shouts out instructions during the first half of Monday’s game against host Ohio Wesleyan. Axelrod played four years at OWU, most recently leading the NCAC in scoring and assists on the way to nabbing the Jostens Trophy as the nation’s Most Outstanding Division III men’s basketball player last winter. 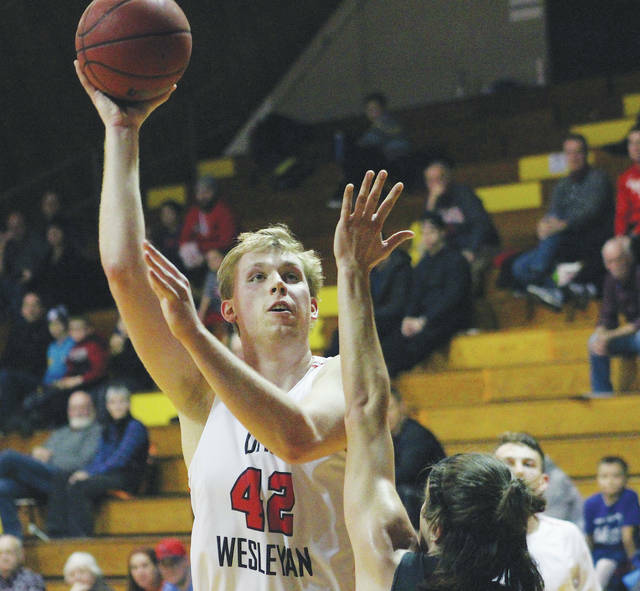 DELAWARE – The Ohio Wesleyan men’s basketball team fought back from a 14-point deficit to send it to overtime, but couldn’t overcome an 11-2 surge by Oberlin in the extra frame, falling 88-84 in NCAC play Monday night. Curtis White gave OWU its first lead at 74-72 with 4:47 left in the extra frame. The Bishops had a chance to add to it, but Joshua Friedkin had a steal and knocked down a 3-pointer to give the Yeomen the lead. He hit two more from long range as Oberlin scored 11 of the next 13 points to put it out of reach for good. 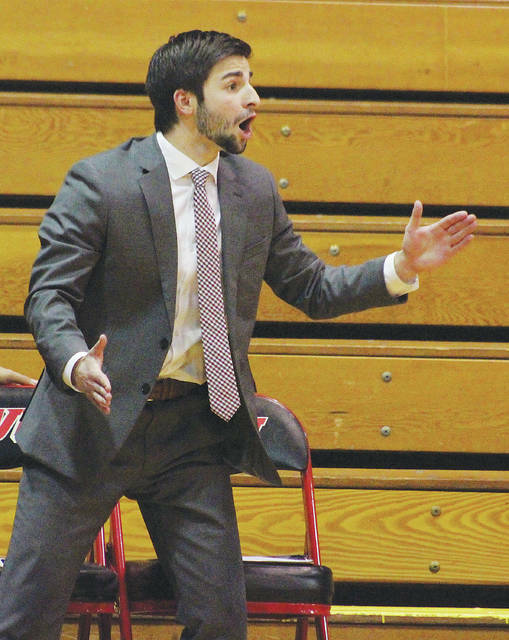 Friedkin’s effort propelled the Yeomen to their first win over OWU since Dec. 11, 1999 – a nice gift for first-year assistant coach Nate Axelrod, who wrapped up his illustrious career at OWU last season. Axelrod claimed to be business as usual before the game. DeWitt was happy for Axelrod’s success … to a point. Friedkin and Andre Campbell had 20 points and five rebounds apiece to lead the Yeomen (9-6, 5-3). Christian Fioretti had 14 points and six assists, Wolf Moser added 12 points and Eli Silverman-Lloyd chipped in nine points and seven rebounds to back Oberlin. Oberlin never trailed in regulation, starting 4-0 and pushing the lead to six early before OWU came back to tie it 26-26 with 8:14 left in the half. Moser buried a pair of 3-pointers in a 10-1 Yeomen run and pushed the lead as high 13 in the final minute of the first half before a Nick Carlson jumper with 17 seconds left cut OWU’s deficit to 46-35 going into the break. Oberlin pushed the lead as high as 14 with an 8-0 run in the second half. Fioretti and Isaac Finestone each knocked down threes before a Finestone block turned into a Fioretti layup to cap it with 10:15 left in regulation. OWU held Oberlin to five points the rest of the way, shutting the Yeomen out for the final 3:08. Ethan Stanislawski tied it up on a layup with 34 seconds left. OWU got it back on a Jaret Gerber steal with 2 seconds left, but Stanislawski’s 27-foot bid to win rimmed out. Axelrod isn’t the first player from last year’s squad to return to OWU as a coach. Seth Clark is a graduate assistant at Otterbein University, which visited Branch Rickey Nov. 20 in a game won by the Bishops 82-76. Grant Gossard had 18 points and seven rebounds, Stanislawski added 17 points and six boards, Carlson chipped in 16 points and Gabe Johnson and Tim Kiefer each dished out four assists to lead the Bishop (8-7, 3-5). OWU is back in action Wednesday night at 7 p.m. when it hosts Wittenberg in conference play.